Ah yes, it is starting to be very nice weather around here. So...that should give a hint as to what we did all day on Saturday...Can you guess? Yes...that's right, we spent the whole day outside in our yard! Made me realize just how many toys we have for outside!! Or should I say really clean toys, now. lol lol As you probably already know the Little Tikes, Step 2, and Fisher Price toys for outside can get a bit expensive. Of course, we wanted to get everything for our son for the most outside fun....but we budgeted and were very smart about what we purchased!! We have a Step 2 swing set that we purchased off of EBay about 4 years ago....it was used when we bought it, but very gently. We paid about $100 for it and it has served us very well!! Now my daughter will get to use it for a few more years too. We had been searching for one for about 4-5 months.....but were patient and waited to find the best deal on one. It worked out well and it was a great buy!! We also have a Little Tikes climber...we purchased that about 2 years ago, from Craigslist. I had been eying one up for a whole summer until I finally found one nearby that was not already sold. Yes, it was October when we purchased it, but that worked out perfectly...the kiddies at his birthday party had lots of fun on the "New Toy". We paid $85 for it....it did have 2 slightly faded pieces...but my son has never even noticed!!!! lol lol They go for about $325 or so new, so I was very happy with the price we paid!!! We still have it today so now my daughter can also have lots of fun on it soon as well!! Our Step 2 Sand Table and Step 2 Picnic Table we actually purchased new, but only because my friend worked for a distributor and we got a nice discount on them. We also have lots of toys others have outgrown and passed onto us....like the Scooter the neighbor actually gave my son...and he just loves it!! The bubble machine was a gift for my daughter for her birthday, as were the soccer nets for my sons birthday. 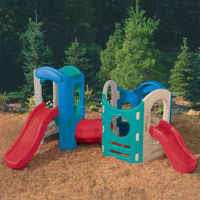 All Little Tikes, Step 2 and other plastic outside toys really do hold their value quite well. As they really do last a very long time!! You just have to be a bit patient when on the lookout for such items. And just remember your little one will never notice if it is used or not...he will just remember the fun times he had playing on/with them!! I promise!! So, keep your eyes peeled....check your local newspaper classifieds, check EBay, Craigslist, Yard Sales, Goodwill, Freecycle, Thrift Stores, and even check out on trash night!! You just never know what you may find and at such a great price..or maybe even free! !